In the unit of Energy Flow, we will look at how organism need food to survive but eventually it too is eaten. 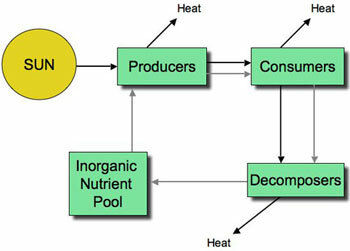 In any ecosystem there is a hierarchy of feeding relationships that influences how nutrients and energy pass through it. We will also look at the sequence of organisms that provide food for one another is know as a food chain​. Ecosystems require a continuous supply of energy to fuel life processes and to replace energy lost as heat. 4.2.U1 ​Most ecosystems rely on a supply of energy from sunlight. Producers absorb sunlight using chlorophyll and other photosynthetic pigments. Food chain: a sequence of organisms, each of which feeds on the previous one. 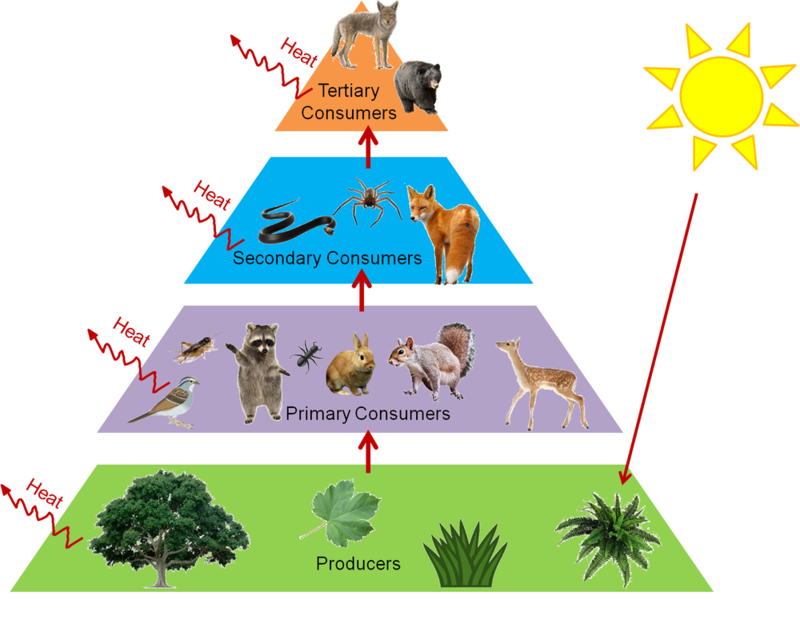 Primary consumers feed on producers; secondary consumers feed on primary consumers; tertiary consumers feed on secondary consumers – so on. Energy transformations are never 100% efficient – not all of the energy from the oxidation of carbon compounds in cell respiration is transferred to ATP. 4.2.U5 ​Living organisms cannot convert heat to other forms of energy. Biomass: the total mass of a group of organisms. Can measure how much energy is added per year by groups of organisms to their biomass. The energy added to biomass each successive trophic level is less. Organisms in a trophic level are not usually entirely consumed by organisms in the next trophic level. Predators may not eat material from the bodies of their prey such as bones or hair. Not all parts of food ingested by the organisms in a trophic level are digested and absorbed. Some material is indigestible and is egested in feces. – Passed on to saprotrophs or detritivores. Only small proportion of energy in the biomass of organisms in one trophic level will ever become part of the biomass of organisms in the next trophic level. 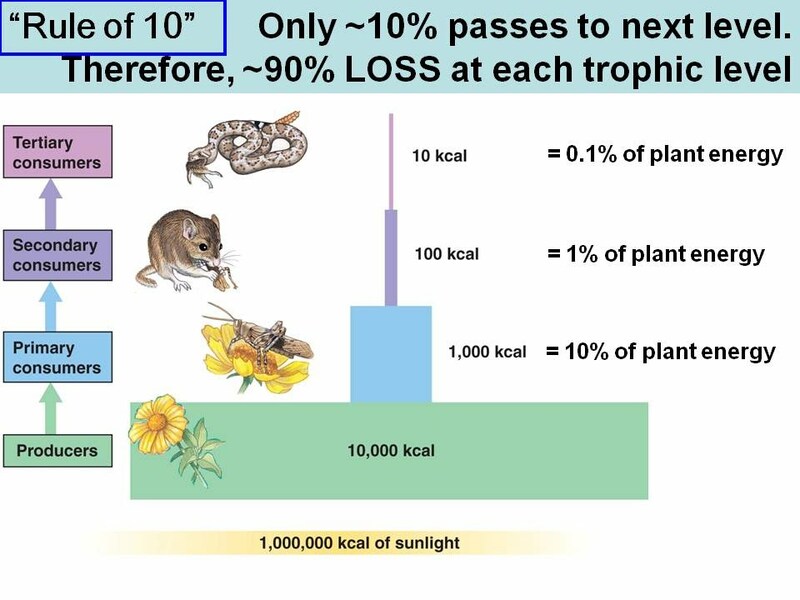 As losses occur at each stage in the food chain, there is gradually less energy available to each successive trophic level. The energetics of food chains is a factor in the efficiency of food production for the alleviation of world hunger. ​What happens at a ‘Whale Fall’? Whale Fall (after life of a whale) [Radiolab] from Sharon Shattuck on Vimeo.